A. You should wear your aligners for 20 to 22 hours daily. You may remove them for eating, drinking and regular oral hygiene. A. No. Unlike braces, you may eat whatever you like as long as you remove the aligners before eating. Prior to placing the aligners back on, it is important to brush your teeth and aligners. A. It is recommended that you remove your aligners prior to chewing gum as the gum may stick to the aligners. A. Brushing them with cool water after every meal or snack will keep them fresh and clean. Toothpaste is not needed, and may actually scatch the surface of the aligners causing more dental plaque to accumulate. A. Regular office visits are usually every six to eight weeks. This will ensure that your Invisalign treatment is progressing as planned. A. Treatment time varies depending on the severity of the misaligned teeth. Treatment time can be shorter than traditional braces, and is typically between six and 18 months. A. 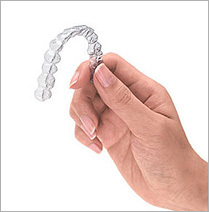 Yes, Invisalign treatment works by the same method that traditional braces work. Light pressures are exerted on the teeth by the appliances, and the teeth slowly move into the desired positions. There are differences, however, that you should discuss with Dr. Goldman prior to deciding on which treatment method is most appropriate for your child.